Many Magic the Gathering players ask the question: How do I build a well-appointed artifact commander deck? I personally think that artifact decks are strong and this attempt should prove it. The basic idea comes from an Niv-Mizzet, the Firemind -deck. As much as I loved the card draw as much I question the wheel-effects in this strategy. When I decided to build a new deck I chose to stay in the same Izzet color pair. The new Saheeli, the Gifted is in my opinion a promising commander card, with many possible interactions and combinations. In the upcoming description I take a short look on different strategies. In summery it may be said that this deck is an artifact deck. I'm not going into deep for anything else like the Eldrazi theme with Kozilek, Butcher of Truth or Ulamog, the Ceaseless Hunger nor is this deck a guidance for competitive EDH. There are indeed very strong cards available, but for reasons considering budget, personal favour and playability I’m going to choose wisely the usage of every card. However, you’ll finde some upgrade suggestions in the designated category. My (yet) not existing Thaumatic Compass has shown me the way to the Krark-Clan Ironworks -Combo. The KCI-deck was played very successfully in Modern until the main card got banned in January 2019. I wondered if it‘s possible to do anything like that in the EDH-format. It is obvious that KCI is not the most fun-to-play-against-deck, but so is any Stax-/ Control-strategy. The importance of knowing how this deck works is very high. In case of running a complex combination the player of this deck has to handle fast and should also be able to explain any combo very well for quick understanding. If this is not trained, then the EDH game could be very boring for any other player and the playing time would definitely put off. Another main thing to be aware is the power level. This deck is not at the highest possible power nor is this a weak one. I personally think it’s a 7.5 of 10, with updates possible to get it to 8.5 of 10. Saheeli, the Gifted is listed as a Tier 3 deck and I share this assessment. In one of the following categories I’m going to present my personal suggestions to upgrade or downgrade this deck. On this point I have to say, that it is very important to know your power level well for having the most fun. Communication is key with other players so everyone’s deck has about the same power. Her character does perfectly fit in the blue and red color pair. While the blue mana is known for intellect, omniscience and technology, the red mana pushes in for emotion, action and freedom. The connection between this two colors is their full-hearted and passionate search for something new. The thirst for knowledge is based on curiosity, creativity and pure progress. The Izzet League on the plane of Ravnica represents the blue/red guild, their members are seeking for the unknown and not primary for might at all costs. And so it‘s nearly the same on Kaladesh. The mana energy floats into creations, always inventing and discovering something with their own hands. Saheeli Rai is one of them and her character shows additional all signs of a very warm-hearted and reliable human being. With the ingenuity of a gifted she is constantly working on a special project. --------------------------------------------------------------------------------------------------------------------------------------------------------------------------------------------------------------- +1 Create a 1/1 colorless Servo artifact creature token. +1 The next spell you cast this turn costs less to cast for each artifact you control as you cast it. -7 For each artifact you control, create a token that's a copy of it. Those tokens gain haste. Exile those tokens at the beginning of the next end step. --------------------------------------------------------------------------------------------------------------------------------------------------------------------------------------------------------------- +1 Create a weak, but useful token to protect the commander. Gives you an additional artifact on the battlefield. +1 Exciting. Big Mana Rock. Affinity ability. It’s possible to play a card with high mana costs very early. Helps to build a steady game presence. You need many artifacts on the battlefield to get more mana out of this ability. No additional effects. -7 Enter- and/or Leave-the-battlefield effects profit from her ultimate. Don’t let her die just for this ability except it’s unavoidable for strategic reasons. Not game winning. This commander card has many ways to build around. The best way to play this commander is to understand the basic ideas behind it. „Tokens“, „Affinity“ and „Copy“ are the 3 main words to describe Saheeli. Those are the lanterns lightening the way of playing this deck. All abilities are summarized as artifact effects and this shows any player who plays Saheeli, the Gifted the right direction for building an EDH deck with her. No worry for drawing you infinite: Codex Shredder , Aether Spellbomb , Pyrite Spellbomb or many other artifacts with mana costs 1 (or 2) don’t have a card draw ability. There are more possibilities to get a combination with Krark-Clan Ironworks, but those are the main ideas behind this card. Izzet Signet : Signets are commander staples. Cheap artifact that gives colored mana. Dross Scorpion : Untaps artifacts, after another one is put into the graveyard. Paradox Engine : Play a card. Untap every mana artifact. Play another card. Untap again. Repeat. Darksteel Citadel : Artifact and Land with indestructible. Izzet Boilerworks : Bounce back a land card to get a tapped nonbasic land, that can produce 2 colored mana. This deck is a combo deck, which strategy is to play very active. The easy part is that in the game you can play whatever you want with constantly improving your board state. You have to look for a card draw engine and keep on pushing the game forward. The more different thing to know is how the combinations work and how to find the best card if you have the option to search your library for any artifact card. If this deck starts rolling off don’t lean back and enjoy it too much – always be aware of the current board state. The game can turn very fast against this deck if you haven’t the right pieces enabled. In this deck there is no card that generates really much hate which is an advantage in a multiplayer game. In my experience this Saheeli, the Gifted deck is better in a multiplayer area then in a 1:1 match. Voltron strategy means that you have a single creature (or at least not many of them) to build them up with equipments (and Aura and Enchantment cards, but those card types are not necessary in a Saheeli-deck) and other spells. After playing some mana artifacts you may use Broodstar , Darksteel Juggernaut , Darksteel Colossus or even Blightsteel Colossus as fatties to finish the game. There are many ways to strengthen those creatures up, consider Lightning Greaves , Loxodon Warhammer , Blade of Selves or any card of the very famous sword series ( Sword of Feast and Famine , Sword of Fire and Ice ). Sadly there is no room for Cranial Plating due color restrictions. To play a control deck you need many Counterspell s and some creatures or planeswalker to protect. The Eldrazi theme does fit very well it you prefer a deck playing more passive then active. Kozilek, Butcher of Truth seems to be a perfect choice, with adding more board wipes like All Is Dust or Earthquake (there are many similar damage cards) you have good options to play a Saheeli deck like this. The most important thing is to keep the artifacts in the game. The thing is that Saheeli needs always a filled hand. The commander doesn’t give anything special to this strategy, so I don’t recommend playing this theme. I recommend Niv-Mizzet, the Firemind , he is a very good commander if you’re looking to play any wheel effects. It’s no problem to get many artifact tokens on the battlefield. 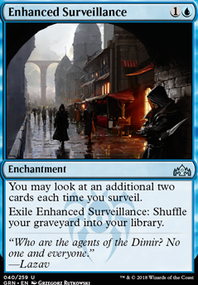 Thopter Spy Network , Loyal Apprentice , Sai, Master Thopterist and similar cards help you to get them into play. Purphoros, God of the Forge is known for his ability in token decks and can be a very good addition. The main question for everyone building a token deck is how fast can you build a stable board? Therefore, Saheeli’s second ability is helpful. If you have many artifacts in the game, then other high cost cards are easy to play. This infamous strategy has the goal to restrict every opponents’ options and keep the own permanents in the game. Everything slows down and it’s difficult to deal with those decks. With many mana rocks in a deck that is built for this purpose you can play cards like Winter Orb , Wildfire and Lodestone Golem . A perfect card is Smokestack , because often you have many tokens to sacrifice available. If you are likely to build and play this control-based theme look at the following deck: Workshop Party which is a great idea pool for any red and blue Stax-deck. In general, this strategy is very effective but does also generate many hates. In a casual format it’s not likely that everyone is happy with you, because in most cases no other deck can shine bright. Always remembering that Stax cards must be defendable, so some control cards are needed. This strategy is very passive, so be patience with yourself while playing any Stax themed deck. Does need very good deck knowing and experience too. Aetherflux Reservoir : Good against this deck, because it can kill you out of nowhere. Without Vedalken Orrery or Shimmer Myr there is no way to cast anything helpful from your hand to prevent this effect. Pithing Needle is the solution but if this card is already on the board, then it’s hard to get it again into play. One option is the ability of Goblin Welder and a sacrifice effect. However, in my mind I’ve Synod Sanctum for flickering the Pithing Needle (or in general any other card). This could be also an answer for many other effects. If you know that any opponent can play the Aetherflux Reservoir, then you must reduce his/her life points constantly. This deck shines against decks who haven’t answers to artifacts or are simply to slow do deal with it. In this category I look on how to improve this deck to a classic combo deck. Most of the suggested cards are expensive so they won’t get a place in many decks. Always keep in mind to stay focused on this deck’s strategy with any change. Unlike Master Transmuter this is a fantastic way to cheat out cards (from the library). It’s worth a recognition, because those two cards are often seen in the same deck for quick board development. Vedalken Orrery , Shimmer Myr , Unwinding Clock : As an active-to-play deck there is no need for those effects. On turn 4 or 5 this deck wants to put pressure on the board, those cards have no quick effect when entering the game. Yes, this could be helpful in many decks, but focused on this decks strategy there is no room for playing artifacts like instants. Trading Post : This is indeed a very flexible card. After some research I chose not to use it, because it has no real interaction with other cards or there are better cards available. For example: If Trading Post is planned for card draw, then this is very slow. You have to pay 5 mana for the first card draw. Sadly, there is no untap-ability included, in this case it may be worth another consideration. Karn Liberated Very expensive card. In many times Spine of Ish Sah is better, because it can be played many times per turn. Guess this planeswalker card in play puts you in front for the main target and there is no need for additional attention against your board state. Kozilek, Butcher of Truth , It That Betrays , Ulamog, the Infinite Gyre : My personal choice is to play without any Eldrazi card. Saheeli would help to reduce the mana costs, but there are also no great interactions between those and other cards in this EDH-deck. If you need a big beefy monster there is always a Blightsteel Colossus in my mind. It depends on your favour, if any of those cards get a place in the final deck list. Hellkite Tyrant : The strategy of this deck is to get the main cards into play and win through combinations. For finish the game you must sacrifice many artifacts. However, the Hellkite Tyrant demands many artifacts into play, so I recommend this card in more token-orientated decks. Platinum Emperion , Platinum Angel : Had those cards in my mind but they didn’t make it in the final list. Both cards can give you the needed time like another one or two turns. They have high mana costs and you must be able to protect them. Would fit in the artifact theme. Rings of Brighthearth : Yes. No. Maybe. I don’t know. It’s hard to argue, that the Rings of Brighthearth wouldn’t support the strategy. In my opinion playable, but I question if this expensive card can clearly power up the deck? Metalworker : In many times you have not many cards in hand. 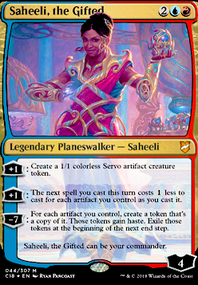 And Saheeli already helps to get more cards into play. Counterspell , Pact of Negation , Force of Will : Any of those cards are too passive. The counter strategy doesn’t overlap with the philosophy of this deck.